Ref No Grave or Memorial / Rhif cyfeirnod bedd: IV. C. 9. 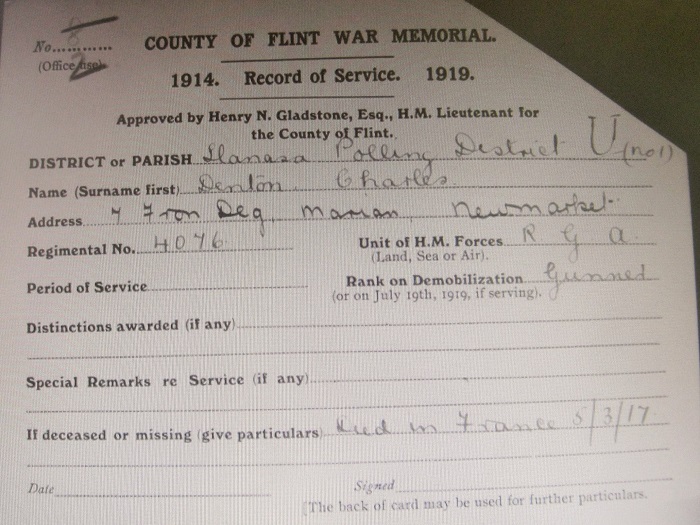 Charles (Chas) Denton is not named on the Newmarket war memorial. However, as he was resident in Newmarket during the First World War his story is included here. Chas was born in Crewe in 1885. His parents, George and Ellen Denton, were married on Christmas Day 1879. He had two younger siblings – Arthur and Rosena. 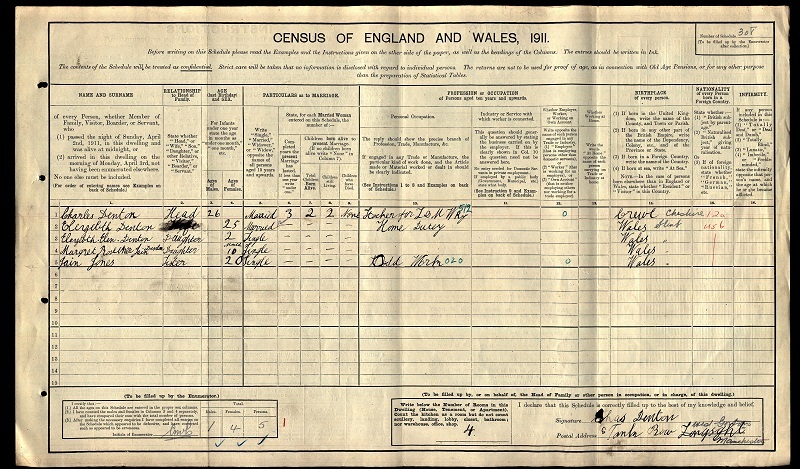 The 1891 census shows them living in Crewe where his father was employed as a railway engine fireman. By 1911 Charles was married with children – two baby girls named Elizabeth Ellen and Margaret. The family was living in West Gorton, Manchester at the time. His wife, Elizabeth (Jones), and their children were born in Flint. Chas seems to have followed in his father’s footsteps as he was employed as a stoker on the London & North Western Railway. By the time he joined up he must have moved to Newmarket as this is the home address recorded on the website ‘UK Soldiers Died In The Great War’. This site also tells us that he enlisted in Stockport and served in the 145th, East Cheshire Heavy Battery, Royal Garrison Artillery, in which he was a gunner. He died in the 16 General Hospital, Le Treport – the town where he was buried.